Reliable. Locally trusted. And guaranteed to never leave a mess behind. Magister Painters London give you painting and decorating services in London which make revitalising your home or your business simple. Transform your living room. Prepare a bedroom to welcome a new addition to your family. Refresh your shopfront’s exterior. Redecorate your office to match your new branding project. Or simply spruce up parts of rooms like skirting boards or ceilings. Whatever you need, Magister Painters London have the experience and highly skilled team to make it happen for you. Count on minimal disruption. After so many years in the industry, we know how important causing next-to-zero disturbance to your daily routine is when it comes to painting and decorating. Get the skills for whatever kind of situation you have. Do you need exterior or interior painting? Home or office painting? Whatever specific job you have in mind, just call. You’ll find we have the perfectly skilled professional, ready to get to work for you. Rely on a team of proven and experienced painters and decorators. The professionals who will be performing all work for you are fully vetted. Very knowledgeable about the best methods and techniques to use in any situation. And they know how important it is to work hard – yet carefully – until your job is done. Punctuality. Neatness. Courtesy. These are some of the most important qualities when it comes to inviting professionals into your home or business property. 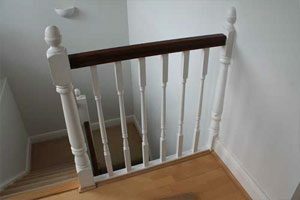 All of the Magister Painters London team have many years of experience. So they understand that turning up on time, being neat and tidy and treating you with courtesy and respect are key parts of the service which they provide. That’s in addition, of course, to high-quality painting and decorating. Wherever you need it. Around or outside your home or place of business. Why use our painters and decorators? The first part of making your painting and decorating services happen is always to get in touch and tell us what you need. By letting us know exactly what you have in mind you will always get the team of painters and decorators whose expertise most closely matches your vision. They can then get started turning your plans into reality. Get the kind of professional you need. Passionate. Reliable. Highly dedicated. The key to making sure we keep you and all of our customers happy is team selection. You will know that everyone who arrives wearing the Magister Painters London uniform can be trusted to work fast, efficiently and well until your job is finished. 100% satisfaction always achieved. You’ll always be given final approval on the work you have done. You had a vision in mind when you first requested your painting and decorating services in London. Did we meet it? Let us know. Achieve the perfect finish. With a huge range of standard and speciality paints. Experts in interior and exterior painting services. And long experience in successfully completing projects of all kinds. You will always be able to get the perfect finish. Talk to us today on 02034043311. Tell us what you need. Get more detailed information. And arrange your service for whatever time is best for you.